The Mouth, by Lincoln Michel, in the most recent issue of The Vestal Review. Great story about a man with a mouth on the top of his head. Two great flash fiction pieces from Joseph Young, Best Friend and What Happened Was. Aw heck, just check out Mr Young's blog, Flash-Light and read anything. You won't be disappointed. As I said somewhere else, it's like the opposite of Chinese food, you read a piece in a minute or two, and hours later you're still experiencing it. Dave Clapper's blog, a great resource for finding new flash fiction and writers. Mr. Clapper's most recent publication at The Journal of Modern Post, Dear Coca Cola. The casual soda drinker will read it and laugh. If you feel the way I do about soda, you'll read it and cry. 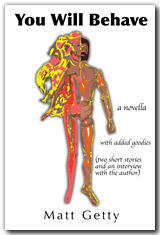 Smokelong Quarterly, a strong on-line flash fiction magazine with author interviews. The interviews are actually a nice touch. It's refreshing to get a little more than a bio--like behind the music for flash. Three great poems from Tripp Howell, And the Compass Itself Was Art, An Anti-Creation Myth, and Core. Reminiscent of Simic's The World Doesn't End, these imaginative poems stack their images with a playfulness that will charm you into seeing the world new again. As for my own site, new poetry has been posted--most notably a new poem about the semicolon. The fiction page now has pictures. You Will Behave will be posted on this site in the next week or so. thanks, again, Matt. I'm hoping I can get something new up soon. I'm going through a little dry spell. No problem Tripp. And I've returned that missing "p" to your name. Apparently it ran off with a "q" on a nine day drinking binge. You know what they say about those guys . . .
Hey, thanks, Matt! Dunno how it was I didn't see this post til now.